Does your garage have lawn care tools all over the place? If youre like most people, your lawn and garden tools are scattered around your garage because they dont have a designated storage spot. Ideally, the best place to store your lawn and garden tools is in a shed, NOT your garage. However, for those of us who dont have a storage shed, there are several ways to make a home in the garage for lawn care tools. Home improvement centers and most local hardware stores sell some type of lawn tool organizer system and theyll give your garage a professional look and feel. These systems are a good storage solution. Theyre usually made of plastic and they are designed to neatly hold lawn and garden tools like rakes and shovels as well as sweep and push brooms. If you dont mind sacrificing the look and feel, you can save yourself quite a few bucks by using a good old 2x4 as a yard tool organizer for your garage. Simply put, using a 2x4 is the easiest, cheapest, and most practical way to organize your lawn tools. As you can see in the picture, a 6 foot long 2x4 and some nails makes a great yard tool organizer. Like the fancier plastic organizers, the 2x4 can hold brooms as well. In order to hang some of the tools or brooms, you may need to drill a hole near the top of the handle so you can slip it over a nail. Or you can run a piece of string through the hole, tie it in a loop, and use it to hang the tool from the nail. Your lawn tools can take up valuable space in your garage. 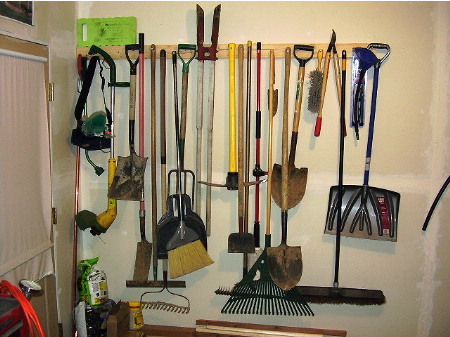 By utilizing either a plastic yard tool organizer, or a 2x4, you can quickly free up floor space by giving the tools their very own wall space in your garage. Once that happens, theyll always be easy to find and youll never trip over, or stub your toe on them again!